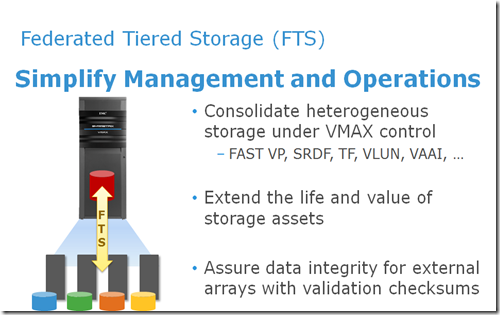 Federated Tiered Storage, is another new feature. it will enable you, our customers to utilize your existing storage assets behind the Symmetrix VMAX, specifically around the utilization of FAST as a new tier. This will not only help you to extend the life and value of your storage assets but it also helps you to consolidate your storage under a single, market-leading environment to take advantage of all the VMAX capabilities including FAST, SRDF, TimeFinder, VLUN, VAAI, andtoher important feature is that we’ve implemented data integrity validation to verify that the arrays behind VMAX are in fact delivering the data that we put there. FTS is implemented entirely in Enginuity and does not require any additional Symmetrix hardware. Connectivity with an external array will be established through the same fibre optic SLICs currently used for configuring FAs and RFs. Instead of running FA or RF emulation, however, the processors will run a new type of emulation. A new emulation, referred to as DX, (for DA eXternal) has been developed that adapts the traditional DA emulation model to act on external logical units as though they were physical drives. The fact that a DX is using external LUNs instead of a DA using internal LUNs is transparent to other director emulations and to the Enginuity infrastructure in general. With respect to most non-drive-specific Enginuity functions, a DX behaves the same as a DA. An eDisk is a logical representation of an external LUN when it is added into the VMAX configuration. The terms “eDisk” and “external spindle” both refer to this external LUN once it has been placed in an external disk group and a virtual RAID group. External disk groups are virtual disk groups that are created by the user to contain eDisks. Exclusive disk group numbers for external disk groups start at 512. External spindles and internal physical spindles cannot be mixed in a disk group. An unprotected, virtual RAID group gets created for each eDisk that gets added to the system. The RAID group is virtual because eDisks are not protected locally by the VMAX; they rely on the protection provided by the external array. • External Provisioning – Allows the user to access LUNs existing on external storage as raw capacity for new Symmetrix devices. These devices are called externally provisioned devices. through Symmetrix volumes. These devices are called encapsulated devices. adds it to the specified external disk group. External disk groups are separate from disk groups containing internal physicals and start at disk group number 512. Because RAID protection is provided by the external array, eDisks are added to unprotected virtual RAID groups. Symmetrix devices can then be created from the external disk group to present to users. created and added to the specified external disk group and unprotected RAID group. Symmetrix devices are also created at the same time, allowing access to preserved data. Otherwise the Symm devices will be treated as any other VMAX volumes. • Encapsulation for virtual provisioning (VP encapsulation) – Just as with DP encapsulation, the external spindle is created and added to the specified external disk group and to an unprotected RAID group. Data devices (TDATs) are then created and added to a specified thin pool. Fully non-persistently allocated thin devices (TDEVs) are also created and bound to the pool. Extents are allocated to the external LUN through the TDAT. Next Post Next post: VMworld 2012–Please vote for my sessions!